Researchers have discovered a new phase of solid carbon they call “Q-carbon” which is a distinct phase of carbon different from graphite and diamond. They have also developed a way to use lasers to create this new phase of diamond at room temperature and at ambient pressure. The following publications list some of the recent research being conducted on this topic and the researchers involved. These researchers are trying to learn how to manipulate the properties of this new material for applied science and for the benefit of mankind. Now the Spiritual insight that we receive from these things is related to the instantaneous transformation of the carbon to a new type of material (Q-carbon) that has very unique properties. Can you think of anything that functions in a similar manner according to the Apostolic Writings? When a person places his faith in Yeshua the Messiah, the Lord God Almighty sends His Spirit to dwell in our hearts which transforms us and gives us some very peculiar properties (very unique properties) in comparison to the world’s standard. (We believe in equal rights towards others, the rights to liberty and freedom, love, prosperity, mercy, justice, and truth.) These things are described for us in the Torah according to Parashat Vayelech (Devarim / Deuteronomy 31:1-31:30). According to Sefer Devarim, Moshe is explaining to the people the blessings and the curses that will come if they do not love and obey the Lord God Almighty. Moshe also tells us that the Lord God is going to transform (cut away at) our hearts so that we will love the Lord our God and not depart from His commandments. The consequence of this action (God working upon our hearts) causes us to be a peculiar people. At the end of the book of Leviticus in Parashat Bechukotai, the Lord says through Moshe the following: Vayikra / Leviticus 26:40 ‘If they confess their iniquity and the iniquity of their forefathers, in their unfaithfulness which they committed against Me, and also in their acting with hostility against Me 26:41 I also was acting with hostility against them, to bring them into the land of their enemies or if their uncircumcised heart becomes humbled so that they then make amends for their iniquity, 26:42 then I will remember My covenant with Jacob, and I will remember also My covenant with Isaac, and My covenant with Abraham as well, and I will remember the land. (NASB) These Scriptures indicate that if the people repent and turn from their sins, the Lord will remember His covenant with Abraham, Isaac, and Jacob, to deliver and save His people. According to the Torah, repentance (Teshuvah) is part of the heart circumcision process in which the Lord God Himself cuts away to transform us into a peculiar people. We read Moshe saying in Devarim / Deuteronomy 10:16 ”… and stiffen your neck no longer,” meaning we are to be humble before God. The Description of the Lord God being involved in the cutting away of the dead parts of our hearts, is a description of the Lord working in our lives to change us from the inside out. This is a theme that is being taught in the Apostolic Writings in relation to having faith in God’s Messiah Yeshua. The disciples and the Apostle Paul taught that it is the Lord God who causes us to have the desire to draw near, to walk in His ways, and to seek His holiness and righteousness. These are the things that are found within the details of the Salvation of God for His people. The Lord is looking for the inward change which leads to outwardly living for Him. He is looking for a people that seeks Him and seeks His will in their lives. These things are the description of the transformation of our lives that God is speaking about in the Torah, and what happens when we believe upon Yeshua His Messiah. Paul wrote the following according to Romans 12:1-2. In Parashat Tetzaveh, we read how Moshe describes the consecration process for Aaron and his sons as they enter into the service of the Lord. These Scriptures from the Parashat Tetzaveh on the Wave Offering teach us very practical applications to God’s Word in relation to the Sacrifice and our lives like what Paul is teaching in Romans 12. We must be willing on a daily basis to allow the Spirit of God to search us and to expose what is not of him. This is why the Psalmist stated in Tehillim / Psalms 139:23-24, “Search me, O God, and know my heart: try me, and know my thoughts: And see if there be any wicked way in me, and lead me in the way everlasting.” In the commissioning of Aaron and his sons, there was the laying on of the hands that is coupled to the blood of the bull, the sacrifices, and the wave offering before the Lord. Note that not only were the sacrifice, the grain, and the oil waved before the Lord, the Torah describes how even the priests were offered as a wave offering before the Lord in this process of commissioning. The entire life of the priest, and even the entire community (Levites) stood as an offering before God. This describes for us how the faithful stand today as an offering before God, and provides insights into Paul’s words in Romans 12 of offering our bodies as living sacrifices. 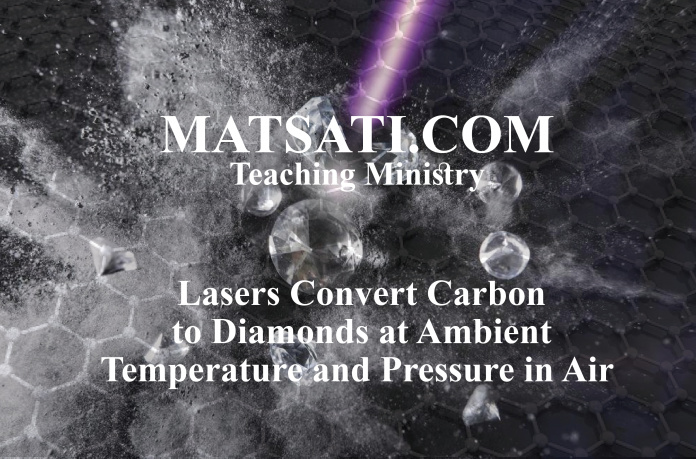 The research using lasers to convert carbon to a dense Q-carbon crystalline structure reminds us of the transforming power of God and of the Messiah in our lives according to the Torah. In the literature, we learn how these Researchers used sapphire, glass, or plastic as a substrate for growing different types of crystalline structures. The Torah functions in this way, as we believe in God’s Messiah, the Lord God Almighty sends His Holy Spirit to dwell in our hearts. We are then set upon the path of walking in God’s ways as we are transformed by the way God gives us the desire to live for him, the peculiar properties that characterize us as God’s people are to love even our enemies, to pray for our enemies, and to feed them. This is what who we are in Yeshua the Messiah, and this is our task at hand, to live our lives as a holy people before a holy God and proclaiming this Gospel to all the World!